Each receiver can be paired with up to 10 transmitters, and each transmitter can be paired with up to 10 receivers. 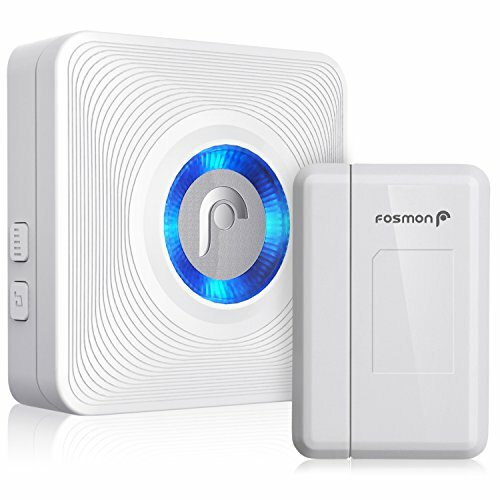 The following SKUs are compatible with Fosmon WaveLink Series Receivers, Sensors and Doorbells. One (1) receiver and one (1) motion sensor transmitter. Includes mounting bracket and batteries for transmitter. 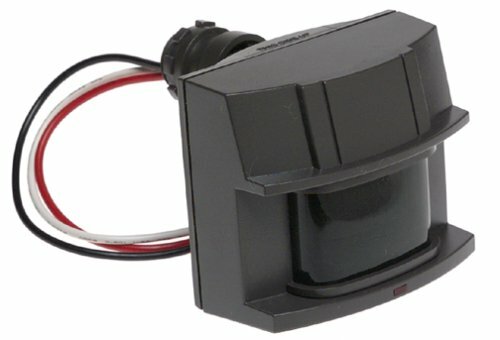 The Bronze Replacement Motion Sensor Replacement motion sensor provides 180 multi zone lens with up to 70' range and 7600 square foot coverage. It has a manual override. Selectable light timer can be set for 1, 5 or 10 minutes. Has a Daytime shut off, sensitivity adjustment, and automatic power outage reset. Controls lighting up to 500 watts. CN. PIR(Passive infrared) Motion sensor is pyroelectric device can detect human movement by detecting Infrared ray emitted by human body. Automatic Induction: When people enter into the range of induction, it will output a voltage equal to input voltage, after the delay time, it will output 0V; during the delay time if motion detected, the delay time will reset, and start a new delay time. widely used on the Motion-activated lighting, LED strips Security System, automatic sensory device and more. 1.Don't exposed to direct sun light or lighting, big wind, near a heater or air condition. 2.Don't fix it at a place where there are obstructing material (e.g. Glass, dense clothes) which IR cannot get though. 3.Don't fix it in strong shock or vibration environment. 4.The PIR Sensor requires a 'warm-up' time in order to function properly, about 10s to1min,depend on the delay time; during this time, the signal triggered by the module is not stable, after one minute, it will be ready. Motion Activated : Sensor function triggered by motion, you can use this small motion sensor switch to control lighting like Led strip lighting. Light Sensor Adjustable : This function allows you to use the motion sensor in different ambient condition, for example, you set the light sensor value to 20 lux, when the room ambient light value is above 20 lux, the light won't turn on, but when room ambient light value is less than 20 lux, the sensor can turn light on when motion detected within sensing range. Delay Time Adjustable- Please set this to its minimum value first then try to figure out your values for the Sensitivity and Light Sensor- this will save your time : The delay time controls how long the light stays on once it gets triggered, during the delay time if motion detected, the delay time will reset and start a new delay time. Sensitivity Adjustable : The sensitivity controls how close you need to be to the sensor in order to activate it. 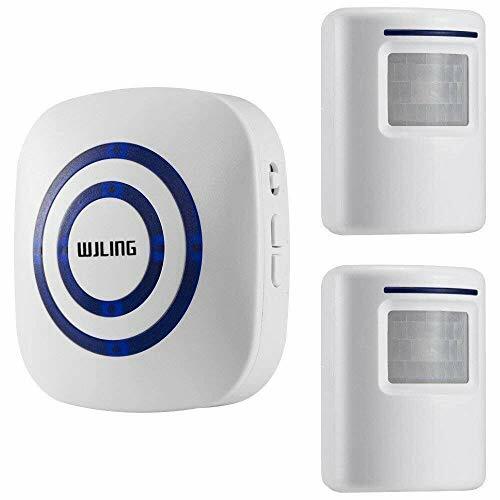 Wide Application : You can use this sensor in different occasions like entryway lighting, cabinet lighting, gun safe lighting, pantry lighting, under the bed rails lighting. 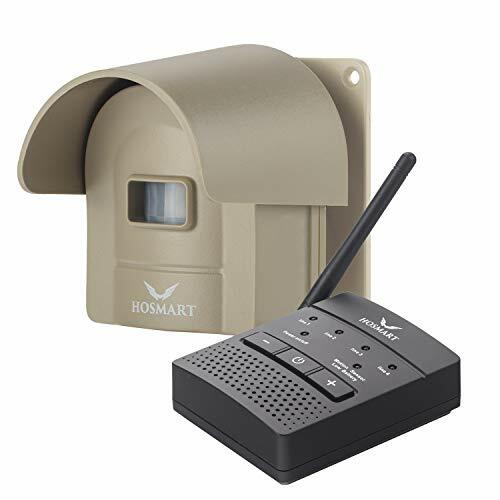 HOSMART ADVANTAGE-30 years+ outdoor driveway alarm wireless and driveway alert system produced in our own factory with our leading edge systems technology.Wireless Driveway Alarm Includes 1 Battery/AC Powered Base Receiver and 1 Sensor. SUPER LONG RECEVING RANGE - 1/4 mile (in ideal situations). Our range is double the mile competitors claim under ideal conditions. We use newer technology components and excellent manufacturing techniques. Our system has been real world tested in settings with trees, buildings, walls, and vehicles. It easily achieves a 1500FT wireless range in most conditions. It's been tested through thick forestry, hail storms, gusty winds, heavy rains, scorching heat, and snow. 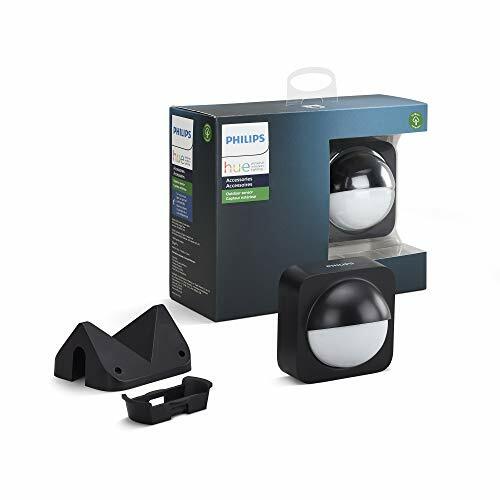 EXCELLENT QUANLITY - Outdoor driveway alert sensor system is made with industrial grade PVC housing, rubberized weather/water resistant seal, and a sunshade. 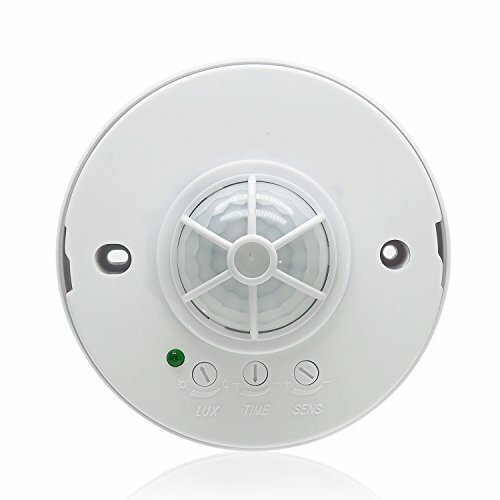 It is an Occupancy Sensor Switch with 360 degree PIR Motion Sensor, 12 M detection distance, Time delay, sensor distance and light sensor adjustable. This Motion Sensor Switch can start the load at once andidentify automatically in day and night, when people enter the detection field. To make item work in daytime: Adjust the light sensor to the "sun"position (max). SUPER OCCUPANCY SENSOR - 3 detectors for triple overlapping coverage to catch even small movements. 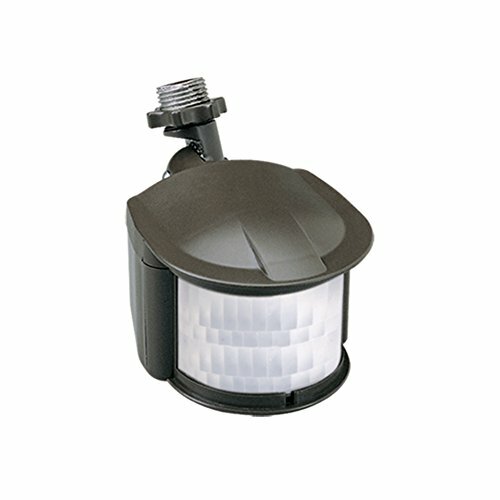 LIGHT SENSOR ADJUSTABLE - 3LUX~2000LUX adjustable, Can work in day and night. TIME DELAY ADJUSTABLE - 10sec-7min adjustable, Time-Delay is added continually, when the occupancy sensor receives the second induction signals after the first induction, it will compute time once more on the basic of the first time-delay rest. DETECTION RANGE ADJUSTABLE - 3-12m adjustable, can be adjusted accordingly, item fits for large room. 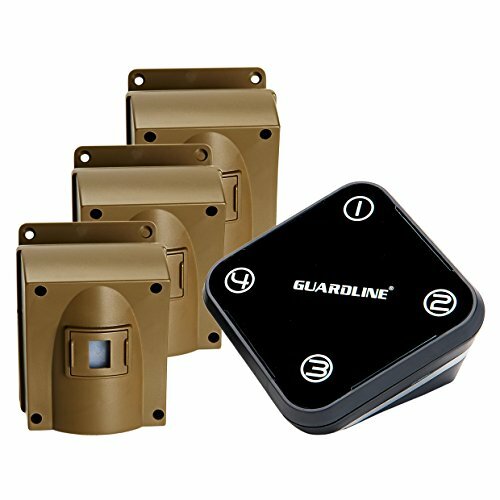 AWESOME SUPPORT- Guardline Security is a Seattle-based small business that has been manufacturing security products since 1999. We are local guys who are driveway alarm geeks and we're obsessed with building reliable, quality products. We offer friendly and knowledgeable USA based tech support that will help you both before and after your purchase. Two year manufacturer's warranty. 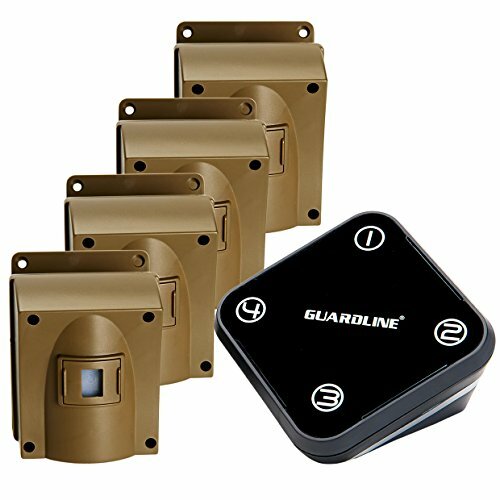 The Guardline wireless driveway alarm is the perfect, easy to use, motion detector for your property. It runs on the included AC adapter and has a built-in battery backup and is easily placeable anywhere in your home. The compact receiver is simple to program and utilizes a loud chime and flashing LED lights when a sensor is tripped. The outdoor motion detector IR sensors come with protective coverings and an easy-mount bracket. 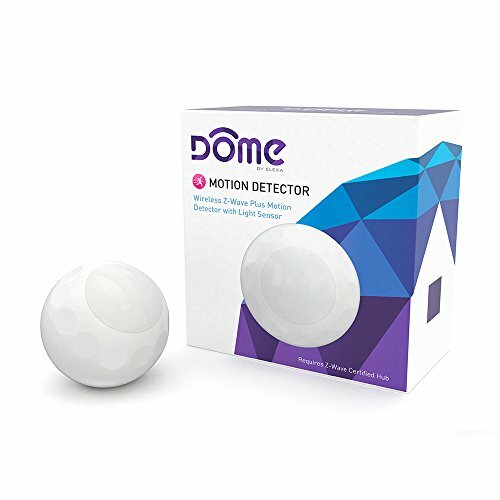 Each set includes four sensors and one receiver (additional sensors and receivers can be purchased and added) offering you dual-zone coverage for your driveway, gate, home, or property. REALISTIC RANGE- 500 ft long range has been tested in real world settings with trees, buildings, walls, and vehicles in order to make true and realistic wireless range claims (please note: extra heavy interference such as thick walls, metal siding, tall hills, and many trees will diminish the wireless range. The mile long range Guardline driveway alarm model is available for longer range and heavy interference installations). 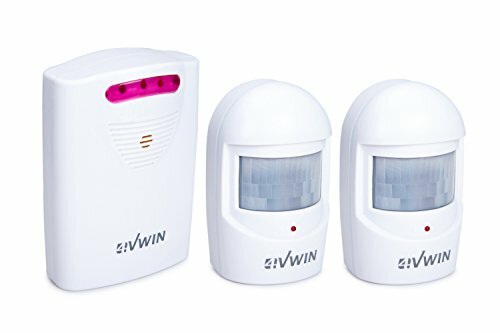 4VWIN Driveway Alarm provides a convenient and economic way to alert you the moment when someone is approaching your home before you see them. 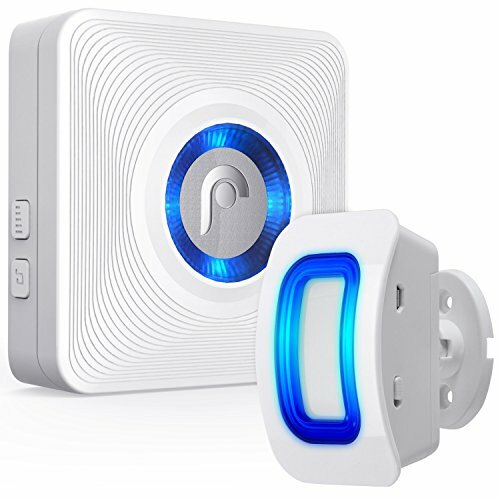 When movement is detected, the PIR sensor sends a signal to the receiver unit from up to 100 meters away. What's more, the receiver can pair with up to 50 sensors, giving the ability to secure a large area. We offer many combinations of sensors and receivers, so simply select the system that best fits your need. Don't mount the PIR sensor in direct sunlight (as PIR detects moving heat sources) or in a place affected by wind. When installing outside, it's best to mount in a shady, protected place with minimal changing temperatures. Also, avoiding mounting on UPVC or metal door frame surfaces which may reduce transmission range. AVOID FALSE ALARM - Do not place the detector in areas where the wind will active it, also try to keep the detective in a clear path to the receiver, so that you can get optimal performance. LONG LASTING POWER - Alarm Base: 3x Size 'C' 1.5V Battery or 6V DC Power Adapter (Not Included); Motion Sensor: 1x 9V Battery Each (Not Included) For the best performance, please use fresh,high-quality, Alkaline batteries. Long Detect and Transmit Distance The transmission range of the driveway alarm is up to 280m/918ft (the distance from the detector to the receiver) and detection range of the infrared sensor approximately 4-8m/13-26ft to keep you informed and safe. You can put the motion sensor detector at the porch, gallery, mailbox and put the receiver in your house. 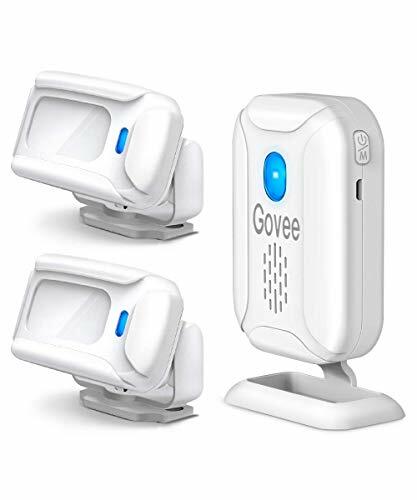 Easy to Use The Govee Driveway alarme is battery operated for fast and easy use.You can just put the receiver on your table or mounted on your wall. There are 5 modes in this driveway alert, it can functions as Welcome/Doorbell/Alarm/Colorful light/Night Light. 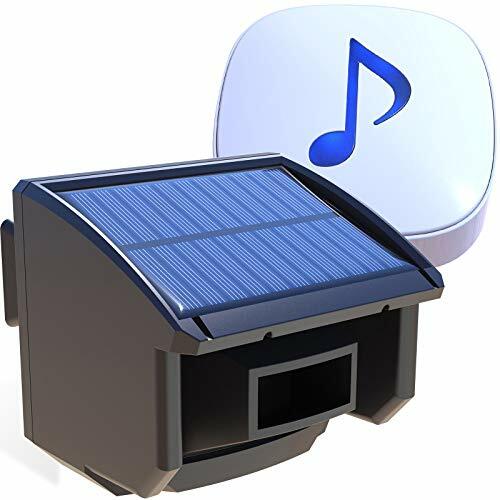 Selectable Ringtones The receiver is a doorbell design with 36 different ringtones from melody sounds to simple basic buzzfor personal preferences and 5 welcome songs for business use. 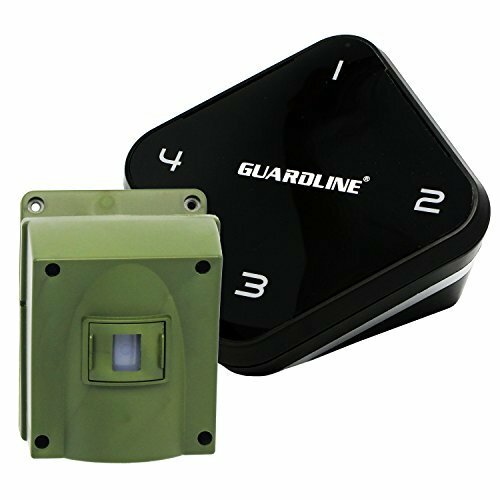 The Guardline wireless driveway alarm is the perfect, easy to use, motion detector for your property. It runs on the included AC adapter and has a built-in battery backup and is easily placeable anywhere in your home. The compact receiver is simple to program and utilizes a loud chime and flashing LED lights when a sensor is tripped. 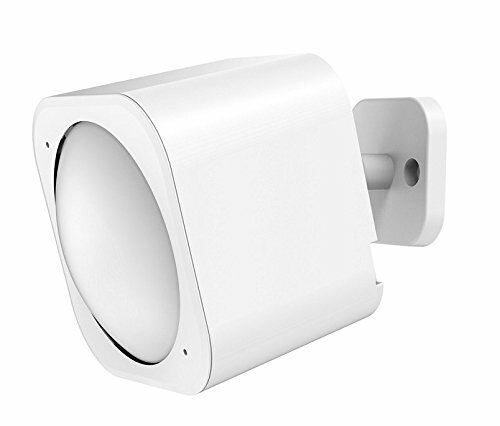 The outdoor motion detector IR sensors come with protective coverings and an easy-mount bracket. 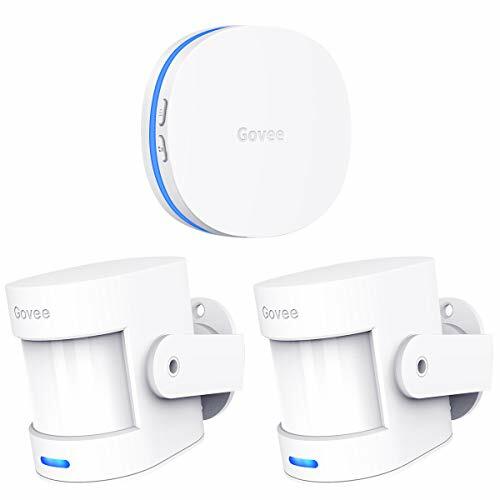 Each set includes two sensors and one receiver (additional sensors and receivers can be purchased and added) offering you dual-zone coverage for your driveway, gate, home, or property.